"Don't f--- with the government!" Black Moon Rising sort of rode-in on the semi-popular, 1980's craze of making movies that dealt with super-vehicles. 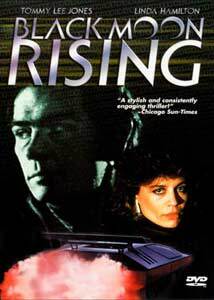 The trailers hyped the supercar aspect of Black Moon Rising, and played up the fact it was written by John Carpenter. In retrospect, this was a bad idea since the film features very little of the supercar, and really doesn't live up to even the worst John Carpenter film. It isn't a bad movie, to be sure, but it's very much a victim of the age. In the story, we are introduced to Sam Quint (Tommy Lee Jones), an expert thief who freelances his talents to anyone willing to pay. He has been hired by the government to help steal evidence that will convict a large corporation of fraud. Quint manages to steal the sensitive financial documents, but finds himself pursued by security agents from that company (led by Lee Ving, ex-lead singer for FEAR). As Quint makes his way to Los Angeles (where he'll turn over the information to the government) he crosses paths with a group of ex-NASA researchers working on an experimental car called the 'Black Moon'. Figuring he'll probably be caught, he hides the microfilm inside the Black Moon, which is headed to L.A. After dealing with the people after him, he locates the car, readies himself to steal back the material, but then a group of a highly advanced car thieves steal the car. So, Quint is forced to now find out who took the Black Moon, and how to get it and the microfilm back. Things are made more complex when he realizes that the woman who stole the car, Nina (Linda Hamilton) works for a sinister millionaire (Robert Vaughn) who has the car under lock-and-key in a technically advanced building where he keeps his collection of stolen cars. Quint enlists the help of the Black Moon's creators to break into the complex, but obtaining the microfilm will be much harder than it sounds. While the movie tells a reasonably interesting story, the presentation is somewhat bland. As I've partially mentioned, the Black Moon is actually a fairly minor piece of the story, and isn't used to full potential. There's a few decent action sequences and car chases, but nothing that really has much power to grip you to your seat. What really damages the movie is the fact that the villains (Robert Vaughn and his evil corporation) don't really make their motives clear. They are simply a generic, unexplained threat, and, let's face it, even in 1986 people were growing weary of Vaughn's endless roles as psychotic, sinister, bad-guys. Most people will probably be lost in the plot, which explains very little of what's going on, which is really bad thing since you don't want the audience of an action/thriller to have to think so much. Acting is pretty good, though, for the most part. Tommy Lee Jones is effective as the confident thief, and Linda Hamilton makes a good, strong female co-lead. The supporting cast is filled with familiar faces from both classic cinema and the B-movie realm: Robert Vaughn's security specialist is played by Nick Cassevettes, Richard Jaekel is the inventor of the Black Moon, the super car's mechanic is William Sanderson (who for some reason is portrayed as deaf), Bubba Smith (from the Police Academy movies) is the government agent who has hired Tommy Lee's character, Don Opper (from a number of Roger Corman/New World sci-fi productions) is an alarm specialist, and I already mentioned Lee Ving (who looks suitably ridiculous in a suit). Actually, it's the cast that makes the movie watchable. Otherwise, I'm not sure the pacing would work too well. Though the film has a good "heist story" edge to it, the suspense is a little thin when the plans have to go totally awry just to give an excuse for an elaborate action scene. Black Moon Rising fits well into the careers of all involved with it, but dates itself badly and succumbs to many clichés along the way. Image Transfer Review: While most of the movie looks nice and smooth, there's a lot of grain in the image. It manifests itself in weird places and causes compression artifacts to pop up in certain scenes. Color and black level look great and the 16:9 enhancement obviously adds a certain level of detail. The age is pretty obvious, though, and the grain effects the overall clarity of the transfer. This is a minor complaint, really, and shouldn't make fans upset. Audio Transfer Review: I have to be honest and say that the Dolby 5.1 mix just isn't even worth mentioning. I'll admit, the LFE channel gets quite a workout (more so than most movies), but otherwise it's a very disappointing mix. It's very much front-loaded, with minimal directionality. I honestly can't recall one noteworthy effect in the surround channels, and except for a little bit of ambience here and there, they're not even used. The most expansive element is Lalo Schifrin's 80's funk soundtrack. There are no flaws, everything is understandable, but it just doesn't really deliver much power, even though the movie does have enough action and activity to keep things interesting. The 2.0 Surround audio is basically the same, but without the level of bass found in the 5.1. Extras Review: The disc contains the original teaser and trailer for the film (both of which are in good condition). The keepcase insert is a nice replica of one of the original (rather hilarious) posters for the film. That's it. The menus are nicely done, though, and the film has a healthy amount of chapter stops. Fans of Tommy Lee Jones or John Carpenter will probably enjoy this release as a casual viewing, but otherwise, it falls a bit flat. It is nice to see Anchor Bay starting to get out their New World Video catalog, though. Try a rental.